Looking at the sleeve, one could underrate this sweet session from a group of West Coast players as just another “Hot Club” effort. But the listener who goes within the cardboard has pleasant surprises in store. 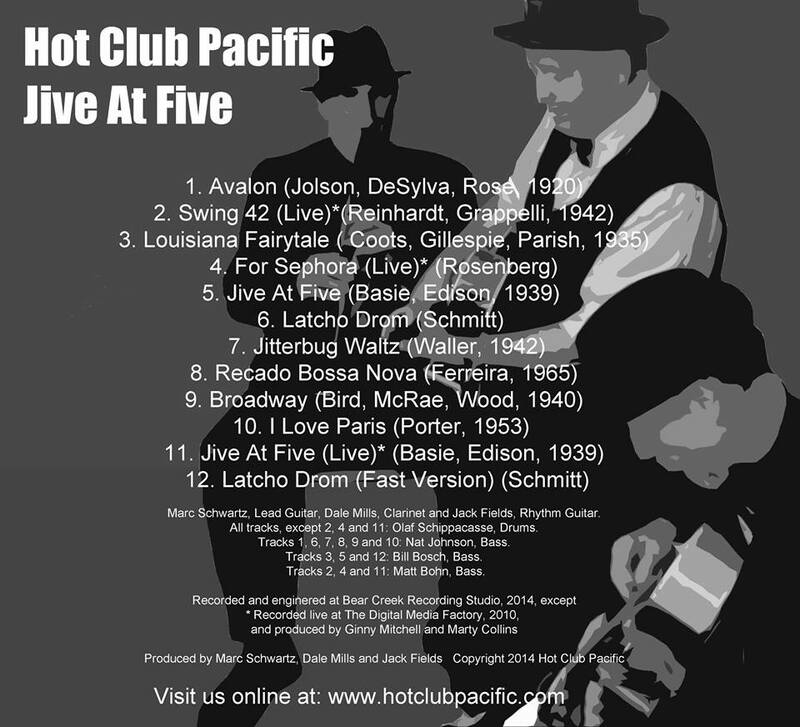 For one thing, the HCP is not bowing low to the Quintette of the Hot Club of France in its most famous — and most imitated — Thirties incarnation, with one solo guitar, two rhythm, one violin, one string bass. Rather, it emulates in its instrumentation the later Reinhardt – Rostaing efforts, clarinet instead of violin. And the group eschews some of the more limiting aspects of “Gypsy jazz,” especially the note-laden guitar solos at searing tempos. 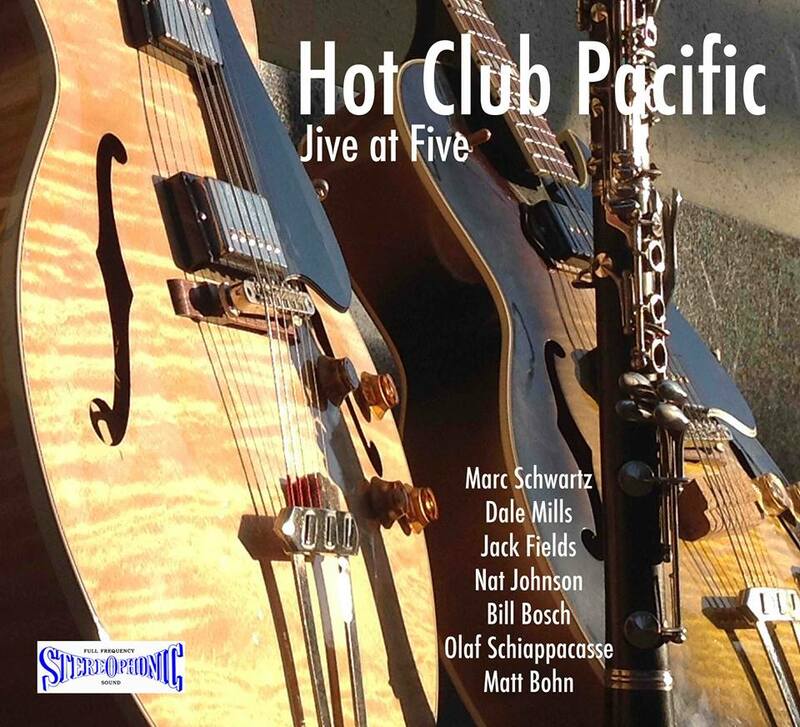 No, this Hot Club leans more towards a Basie / Charlie Christian aesthetic, which is fine with me. The prime movers here are Marc Schwartz (lead guitar), Jack Fields (rhythm guitar), Dale Mills (clarinet), Nat Johnson, Bill Bosch, or Matt Bohn (bass), Olaf Schipiacasse (drums). And you’ll see from the tune list below that they have neatly sidestepped some of the most overplayed numbers in the G.S. repertoire, for which relief much thanks. I know what follows next might seem like faint praise, but as I was listening to JIVE AT FIVE, I kept noting those corners and musical niches where lesser players might have stuffed in familiar quotes, phrases taken from famous records — in short, cliches. And each time the band went its own happy swinging way, which is always reassuring. Here is the HCP Facebook page, and here is what I wrote about them a few years back — with convincing videos. The HCF has regular gigs in the Santa Cruz / Monterey area, best checked on the Facebook page. But for pictures of the band and booking information, there’s no better place than here. The CD is a limited edition, so don’t wait too long to snap up a copy — or else you will be fishing around on eBay. And if you don’t feel that my endorsement is sufficient proof, how about this: guitar maestri Paul Mehling, Howard Alden, and Larry Coryell have visited and sat in during the band’s ten-year run. That’s good enough for me.